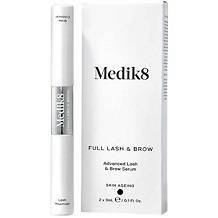 Medik8 Full Lash & Brow claims to grow and strengthen eyelashes and eyebrows to deliver healthier, hydrated, and fuller-looking lashes and brows without irritation. We shall examine various product aspects as well as customer support to determine if this is a worthy purchase choice. This product is vegan-friendly, cruelty-free, palm oil free, and comes in recycled packaging; this is positive to note. Vitamin B5 is known to stimulate hair growth to deliver faster-growing hair through stimulating keratin production. In doing so, it moisturizes the hair leaving it thicker and less susceptible to breakage. Xanthan Gum is a natural thickening agent that boost the luscious appearance of lashes and brows. Soybean extract is an antioxidant that protects the hair from free radical damage as well as anchors the hair within the follicles to prevent hair loss. Myristoyl Pentapeptide-17 is a peptide that is known to stimulate keratin synthesis, whereby strengthening lashes and brows to be longer and thicker. Although these ingredients may be beneficial; the absence of their concentration, as well as the support of patented ingredients, makes us question the efficacy of this formula. Patented ingredients ensure quality as they have been clinically proven to deliver results. Whatsmore, the formula includes some questionable ingredients. As an example, Polysorbate 20 is potentially a carcinogenic emulsifier because it is treated with 20 parts of ethylene oxide. It has also been known to result in dryness and irritation. Furthermore, the absence of cGMP certification raises questions as to the quality standard of the production process. The product comes with a dual-ended applicator. Users must apply the serum to lashes and brows every morning and evening, after cleansing. The precision brush sweeps the serum along the skin of the lash line and waterline from inner to outer corner during application. The mascara wand applies the serum to the brows, using short upward strokes. Customers can buy Medik8 Full Lash & Brow directly from the manufacturer’s website. Each box retails for £34 ($44,56) that comes with 2 x 3ml tubes of product per unit. This product is also available on Amazon at a slightly higher price of $50.00. This price is within the market standard range, although Medik8 offers more value by providing 2 tubes. However, this product does lack the support of patented ingredients, therefore, users may require a longer period of use before results can be seen. The manufacturer offers a 30-day period in which customers can return their products. As long as the product is at least half-full, the return is valid for a full refund. This is positive to note. However, the manufacturer reserves the right to amend or cancel this promotional returns policy at any time. In saying so, customers do not have the guarantee that they will receive a refund. Whatsmore, customer reviews are absent and do not support the manufcatuere’s claims of efficacy. This is a concern. Medik8 Full Lash & Brow has a selection of beneficial ingredients that may help deliver on some of the manufacture’s claims. These ingredients are also cruelty-free and free of palm oil which is positive to note. However, the absence of the ingredients concentrations, as well as patented ingredients, makes us question the efficacy of this formula; especially in comparison to alternative brand son the market. Furthermore, the inclusion of a potentially carcinogenic ingredient is a concern. Although the price is affordable and offers value, the quality of the product is not up to the market standard. There is a clear and supportive guarantee, however, this may change without the customer’s knowledge and cause issues with refunds. For these reasons, as well as absent customer reviews, we do not feel that this product is a worthy customer purchase choice.